I don’t get to return to my hometown of Edmonton very often these days, but when I do I am constantly amazed by how much has changed. I suppose this is true for most people when they return home, but Edmonton in particular has undergone tremendous growth in the past decade or so – owing mainly to the oil industry it would seem. It is bigger, sure, but seemingly more cosmopolitan than the city of my youth. However, no matter how much the city has changed, the Edmonton Oilers hockey club still rules the roost. Growing up in Edmonton in the 80s, we were spoiled by the exploits of the Oilers. I even managed to be in the building for two of their five Stanley Cups between 1984-1990. Winning was simply taken for granted. The team has been poor for many seasons now – and has really never come close to matching their success of the 1980s – but their home rink continues to sell out for every game, at premium ticket prices of course! 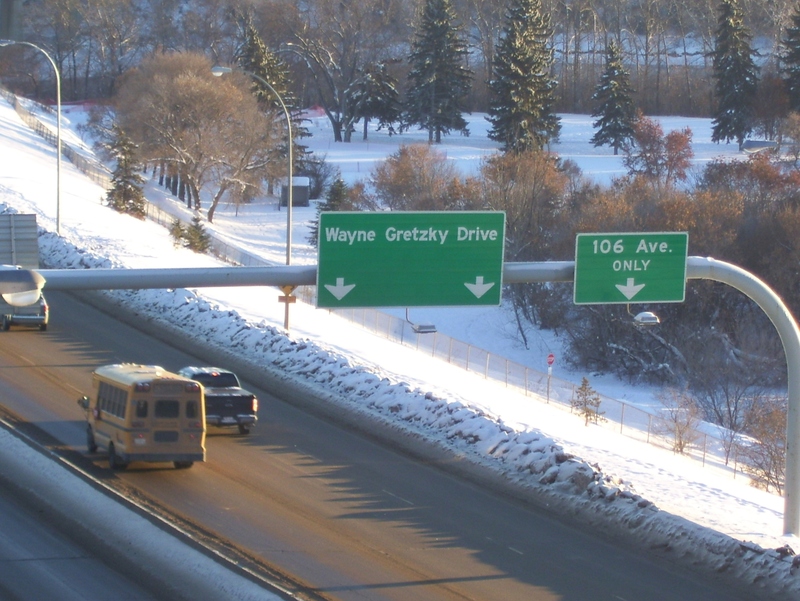 Gretzky hasn’t lived in Edmonton for 25 years, but he still seems to be everywhere. He has his own statue (which sparked debate about whether it should remain in its original location where he played, or move to the proposed new downtown arena) and road past Northlands Coliseum (now Rexall Place). The local broadsheet newspaper is running a “where were you” retrospective on the 25th anniversary of the trade. Even some of the opposition to the Oilers the move to a new arena centre on Gretzky – specifically the heritage fabric of the old rink, that the players of today are playing on the same ice as Gretzky did. However, in my travels around town, I noticed that one key artefact of Gretzky’s Edmonton is no longer there. The Molson House, the location of the now infamous press conference when “The Trade” was announced, has been demolished. I suppose it is a bit sad to see it gone, though I never really thought about it as a site for preservation – even given its link to sport heritage. However, I would love to see a historical marker of some sort, as “The Trade” truly was a very important (although, perhaps, negative) part of not only Canadian sport – but Canadian history. By Gregory Ramshaw in Uncategorized on June 26, 2013 .